Penguin crafts are the cutest and perfect for winter! 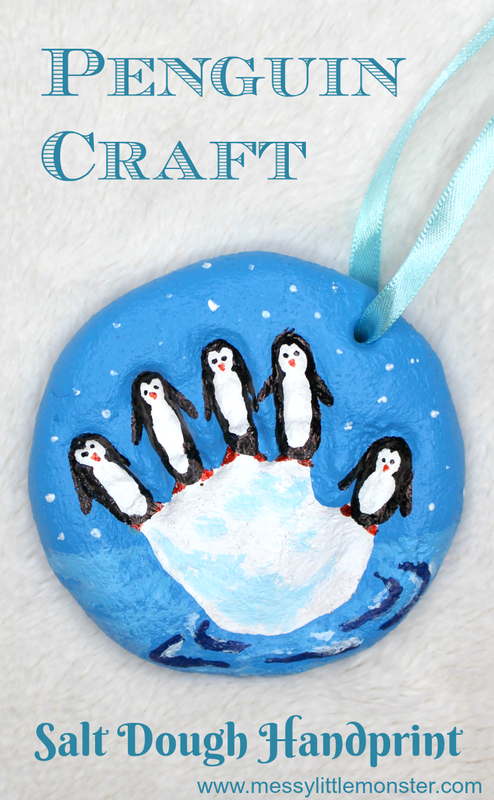 You are going to LOVE our latest penguin craft that is also a baby handprint ornament! 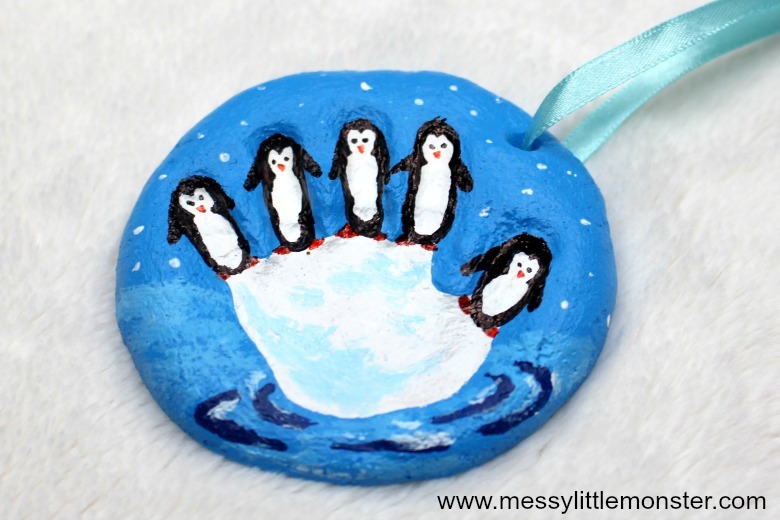 This salt dough handprint ornament is not only great for babies, but it makes an adorable penguin craft for toddlers and preschoolers too! 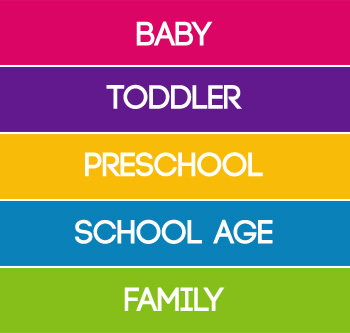 This winter craft is definitely a keepsake to treasure! Scroll down and follow our easy instructions to make your own salt dough handprint ornament (it's a lot easier than it looks and you will already have most of the supplies)! 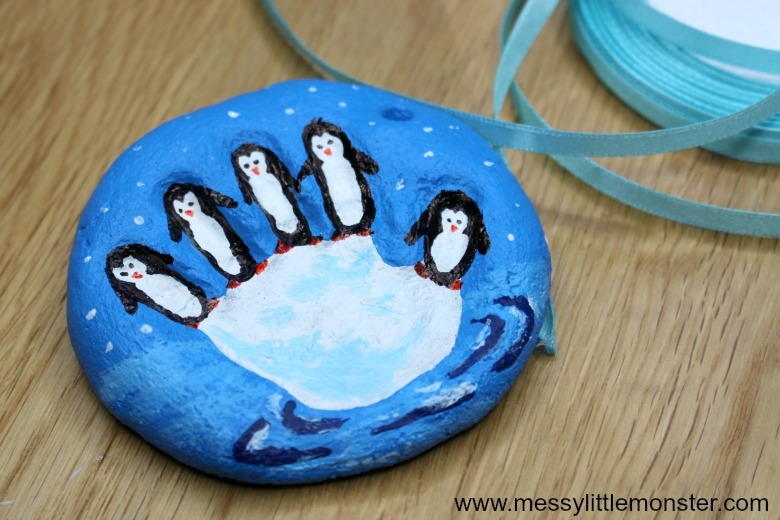 If you love penguin crafts as much as we do you might want to take a look at our other penguin craft ideas. 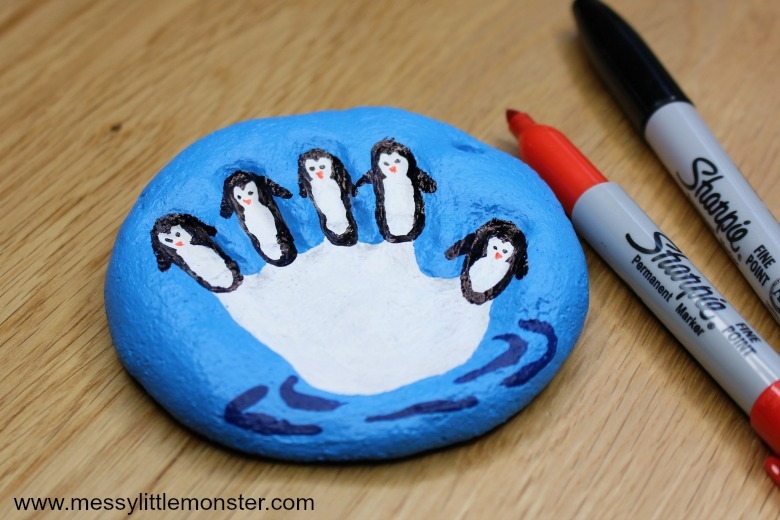 Using just a potato print you can make the most adorable penguin art. 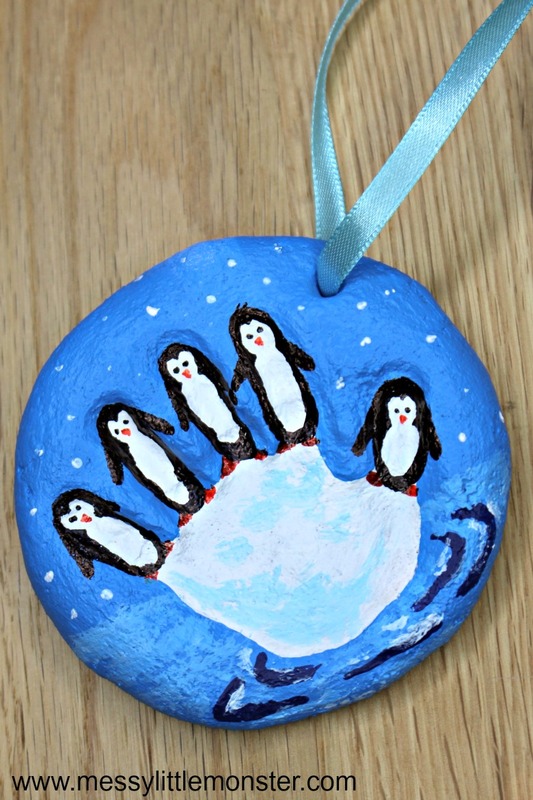 We also have a salt dough penguin footprint and penguin fingerprint ornament that you might like to take a look at. If you are looking for penguin activities for preschoolers and toddlers to go along with this penguin craft take a look at our penguin ice play (which is even suitable for babies!) and our penguin oobleck. The penguin salt dough ornament we are sharing today was made by Oliver at 6 months old, well the handprint was! Baby handprint ornaments like this make adorable keepsakes. Over the years we have made lots of salt dough handprint ornaments, my favourite has to be our santa handprint ornament, but do take a look at all our keepsake crafts. 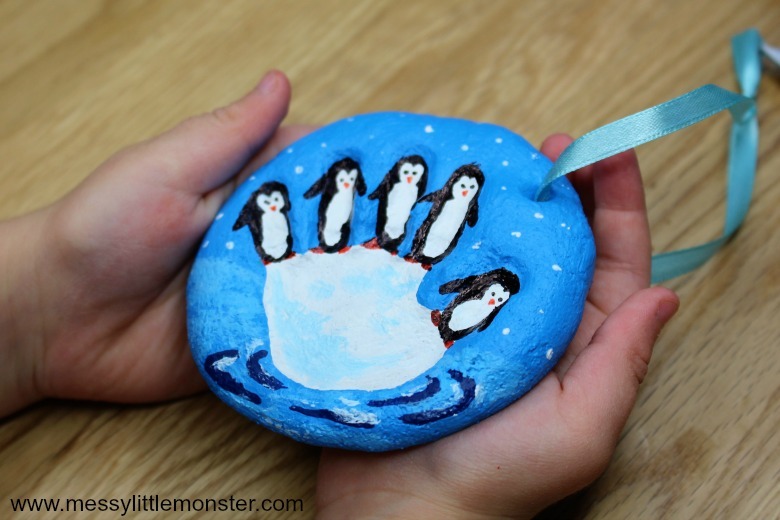 Whilst this salt dough handprint is the perfect craft for babies, it also makes a good winter craft for toddlers and preschoolers, older preschoolers could even add the details of the penguins onto their handprints themselves. 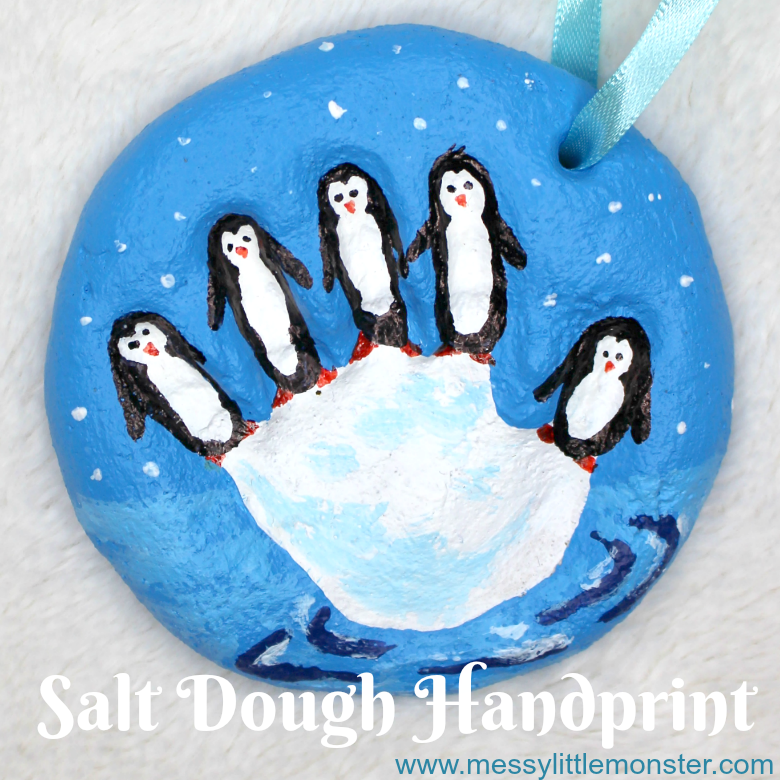 Scroll down below to see how to make your own salt dough handprint penguin. Before you can start making your penguin craft you will need to mix up a batch of salt dough. Making salt dough is so easy! 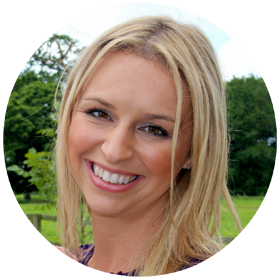 Simply mix 2 cups of plain flour (all purpose flour) and 1 cup of salt together in a large bowl and then add 1 cup of water. Mix the ingredients together and knead the mixture into a dough. Check out our easy salt dough recipe for tips, tricks and different ways to dry and varnish salt dough. 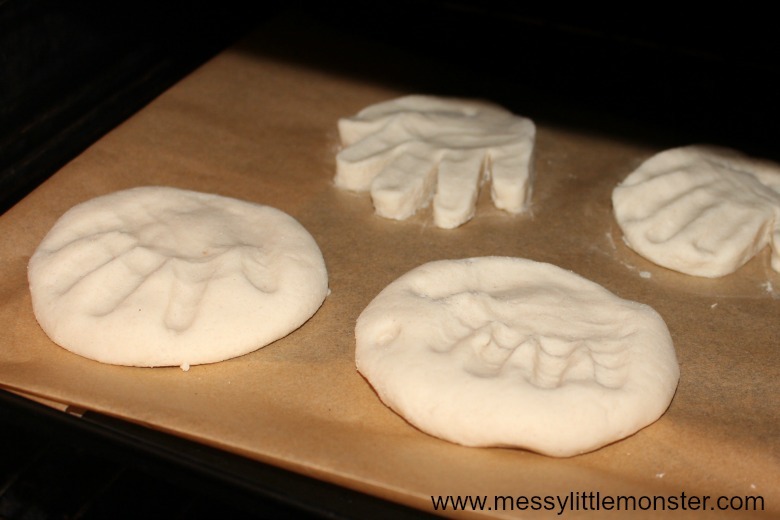 This bit can take a bit of patience, especially if you are making a salt dough handprint with a baby or toddler. 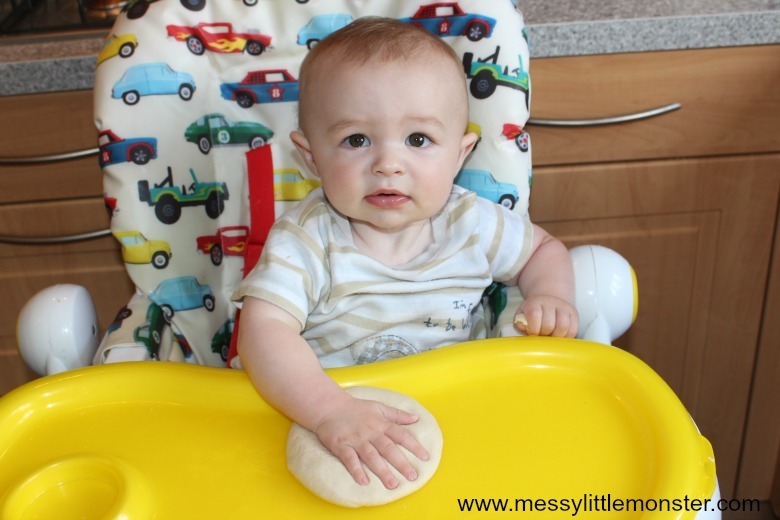 However, the great thing about salt dough is that if your first handprint doesnt work out you can simply roll the salt dough back into a ball and try again! To make a salt dough handprint you need to roll your salt dough into a ball and then press it down so it is between 1cm and 2 cm thick. You are now ready to press your child's hand into the salt dough. You need to press their hand into the salt dough firmly making sure each finger has been pressed down. 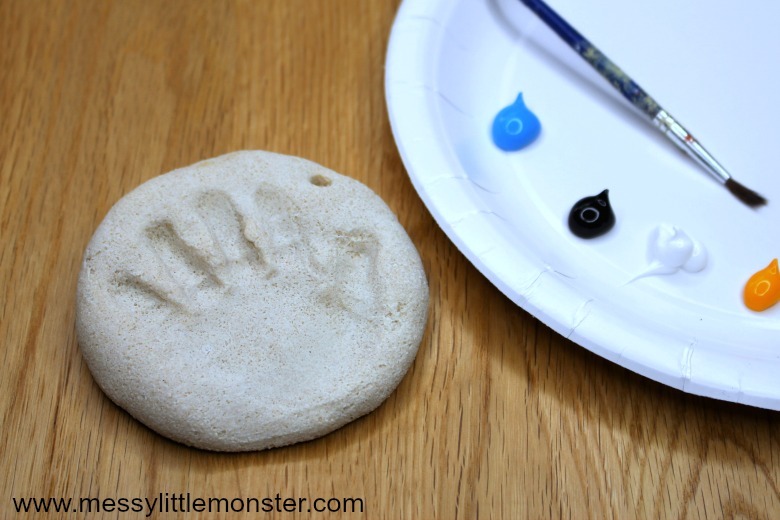 If you are going to turn your salt dough handprint into an ornament you will need to make a small hole near the top of your handprint. I have found that pressing a straw into the dough is the best way to make a hole. Next you need to dry out the salt dough. I have found that the best way to do this is by placing it in the oven at a really low temperature for a few hours, but you can also put salt dough in the microwave for a few seconds to dry it out if you are in a hurry or leave it in a warm room to air dry if you are in no rush or you are making a lot of salt dough crafts. Once the salt dough handprint has dried out it is time to paint it. The best paints to use on salt dough are acrylic paints. I like to squirt a small amount of each colour I am using out onto a paper plate. 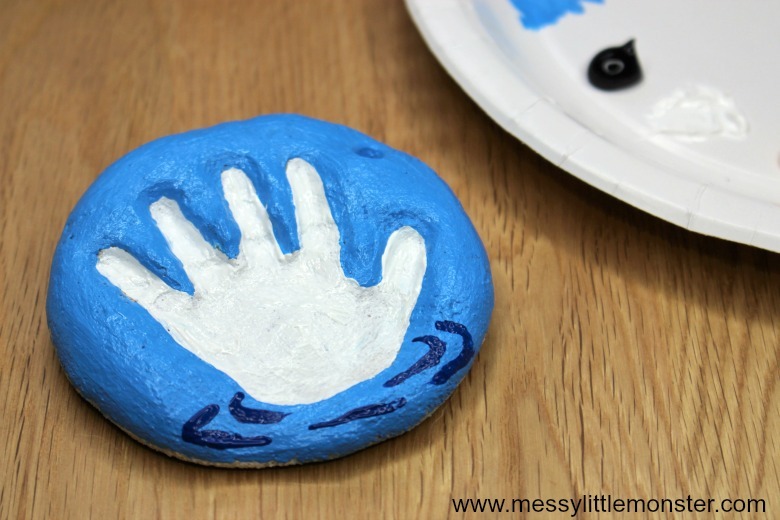 Start by painting the handprint white and then paint the rest of the salt dough light blue. Once the paint has dried add a few ripples in the water using a darker blue paint. You have now created your iceberg in the ocean. The next thing needed is the penguins! Use a thin black marker to draw a penguin shape on each finger. Don't forget to add the flippers! Then give each penguin two eyes and use an orange marker to add a beak. 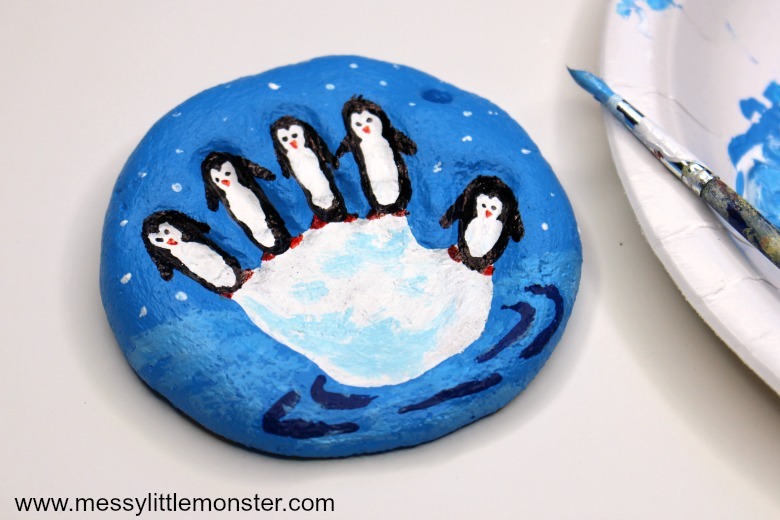 Complete the painting of your penguin craft by using a really pail blue paint to add some highlights on the iceberg and in the ocean. Add falling snow in the sky by making dots of paint using the end of a paintbrush. Leave your salt dough penguin craft to dry. If you want to be able to hang your salt dough handprint ornament you will need to thread some ribbon through the hole. We opted for a pale blue ribbon. Your salt dough penguin craft is now complete! 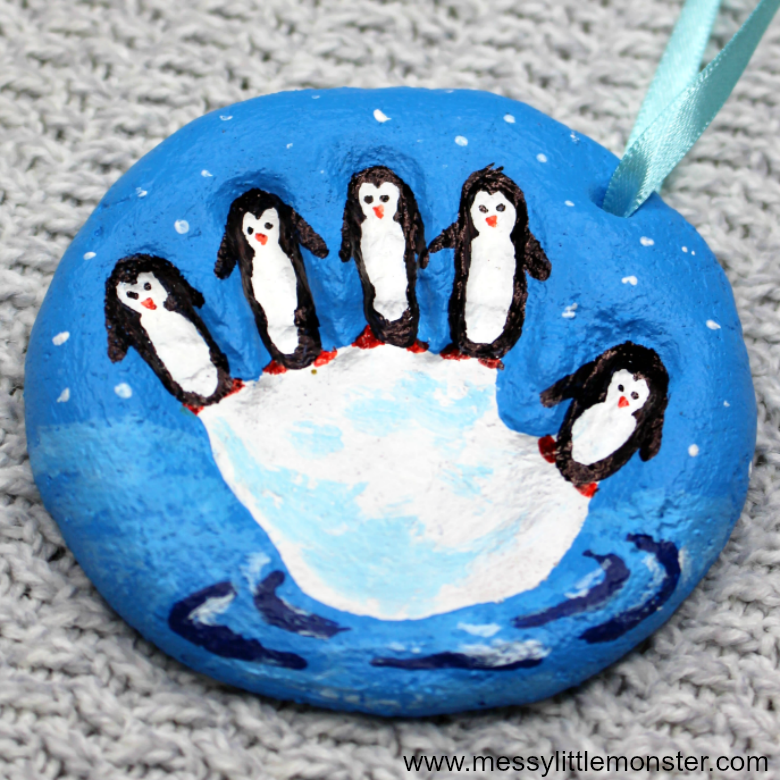 You could make this salt dough handprint ornament to hang on the Christmas tree or you could make this penguin craft as part of a winter craft project. Whatever your reason for making this adorable penguin craft we hope you enjoy making it and then treasuring this beautiful keepsake craft forever! Salt dough handprint ornaments really are the best!